The NMSU Cisco VPN (Virtual Private Network) application establishes a secure connection to our network off-campus. It allows you to perform functions that normally would only be possible while on our network such as file transfer to our web servers (FTP), as well as sending mail without authenticating on our outgoing (SMTP) mail server. The NMSU VPN client can be downloaded from the NMSU VPN homepage. For an encrypted Internet connection or to access the NMSU local area network off-campus, NMSU offers a Virtual Private Network (VPN) Client for students, staff, and faculty to download. The VPN allows users to perform network activities such as mapping a network drive, using FTP for web publishing and sending email without turning on authentication in mail programs such as Outlook, Thunderbird, or Apple Mail. To complete these steps, you will need your myNMSU username and password. If you do not have a myNMSU account, go to https://my.nmsu.edu to sign up. 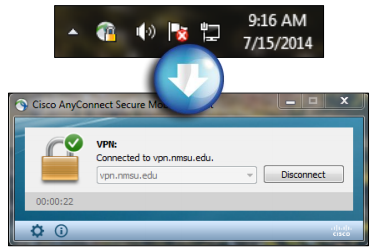 To download a VPN Client for your Windows computer, follow the link http://vpn.nmsu.edu/ to go to the NMSU VPN Client Installer page. 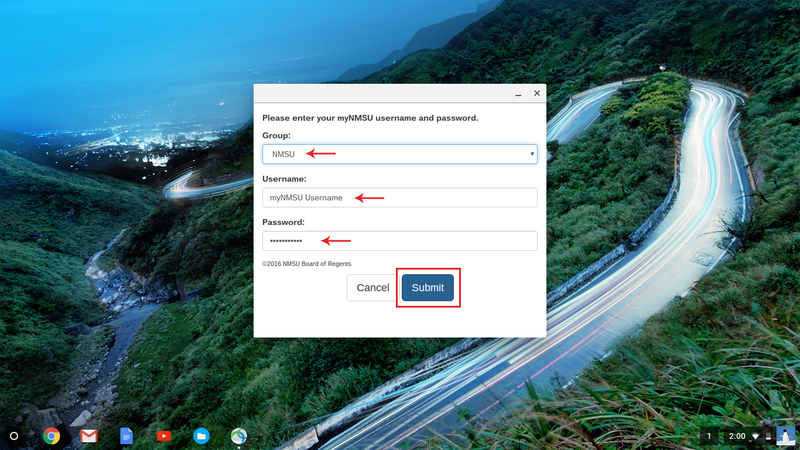 On this page, type in your myNMSU username in the myNMSU USERNAME box and your myNMSU password in the myNMSU PASSWORD box. Now click the Login button. After you have logged in, you may get a message requesting permission for Java TM to run. It is ok to run Java. 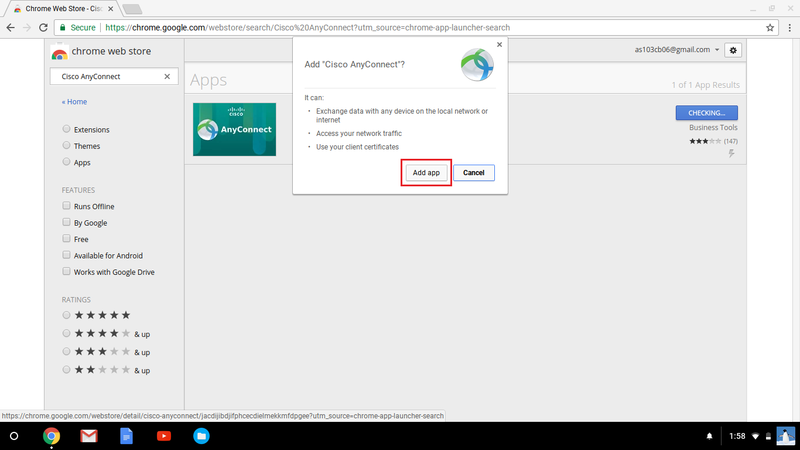 Cisco AnyConnect will now launch and the download will now begin automatically. * If the connection failed, go to the Manual Installation section. Once the download is complete, you will see a warning window asking if you would like to allow the program to make changes to your computer. Click Yes. After the program installs, you will see a message that says that a connection has been established. 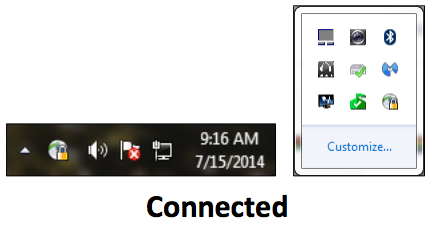 You may see the status of your VPN client in the bottom right corner of the taskbar or in your hidden icons box. When the VPN client is connected, the icon will include a padlock. When the VPN client is disconnected, the padlock will be gone. 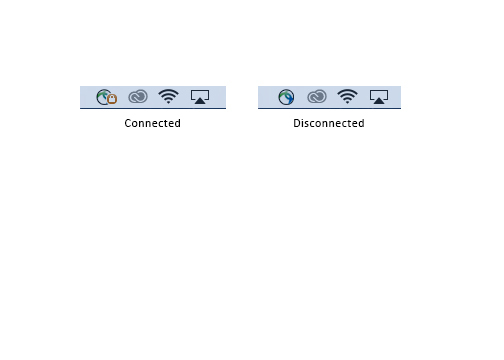 To disconnect the Cisco AnyConnect VPN Client, double-click on the Cisco AnyConnect VPN Client icon in the taskbar. The next window will be the Cisco AnyConnect VPN Client window. In this window, click the Disconnect button. 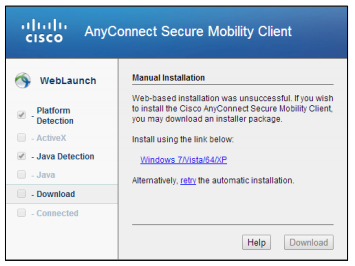 If a Cisco AnyConnect VPN Client window came up in your browser saying that the web-based VPN Connection failed, click on the VPN client installer package titled Windows 7/Vista/64/XP/. In the next window, you will be prompted to run the file or cancel; click the Run button. The next window will ask if you want to allow the file to make changes to your computer. Click Yes. Now you will go through the Cisco AnyConnect installation process. On the Welcome screen, click Next. The next screen will list the license agreement. If you agree, select I accept the terms in the License Agreement and then click Next. If you do not agree, you will need to exit the setup. On the next window, click the Install button. 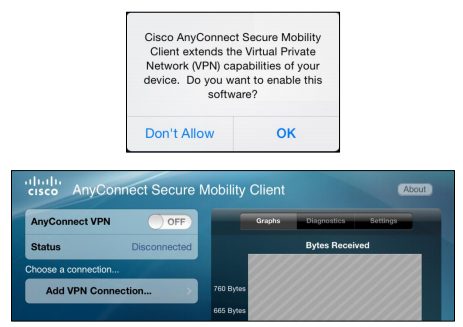 The Cisco AnyConnect VPN Client will now be installed on your computer. This could take several minutes. After the client has finished installing, a confirmation window will come up. In this window, click the Finish button. 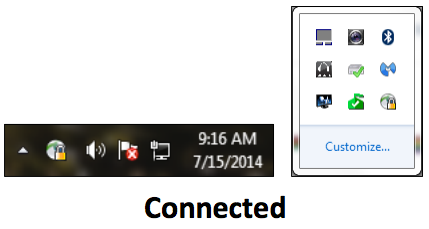 Open the Cisco AnyConnect VPN Client you may access it from the Start menu or, on Windows 8, from the icon in the pane view. 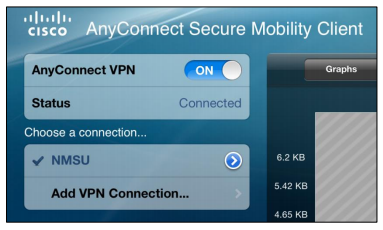 In the Cisco AnyConnect VPN Client window, enter vpn.nmsu.edu in the box and click the Connect button. 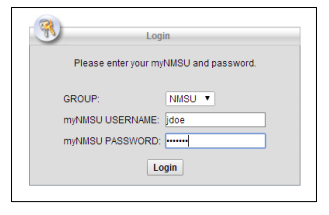 In the next window, type in your myNMSU username in the Username box and your myNMSU password in the Password box. 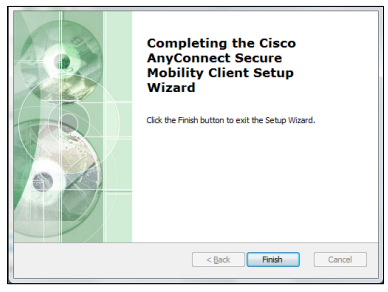 Now click OK.
To disconnect your VPN client, open the Cisco AnyConnect VPN Client window by and click the Disconnect button. For an encrypted Internet connection or to access the NMSU local area network off-campus, NMSU offers a Virtual Private Network (VPN) Client for students, staff, and faculty to download. 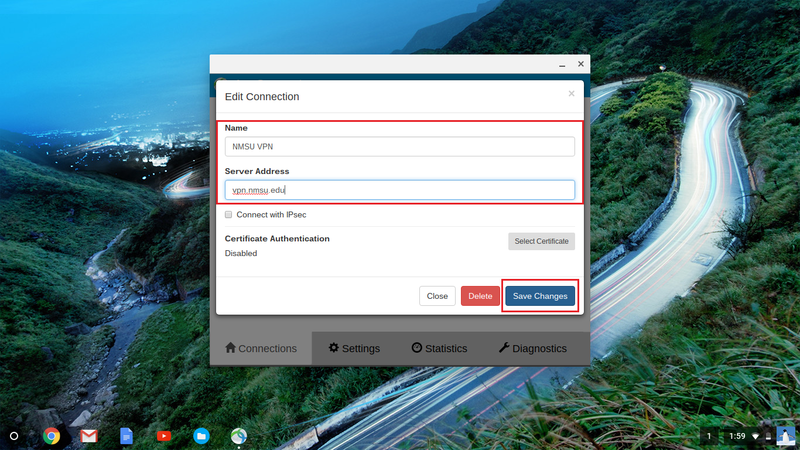 The VPN allows users to perform network activities such as mapping a network drive, using FTP for web publishing, and sending email without turning on authentication in mail programs such as Outlook, Thunderbird, or Apple Mail. To download a VPN Client for your Mac computer, follow the link http://vpn.nmsu.edu/ to go to the NMSU VPN Service page. 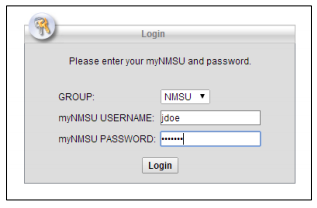 On this page, type in your myNMSU username in the myNMSU USERNAME box and your myNMSU password in the myNMSU PASSWORD box. Now click the Login button. You may view the status of the Cisco AnyConnect VPN Client in the top right-hand side taskbar on the desktop. When the VPN client is connected, the icon will include a padlock. When the VPN client is disconnected, the padlock will be gone. 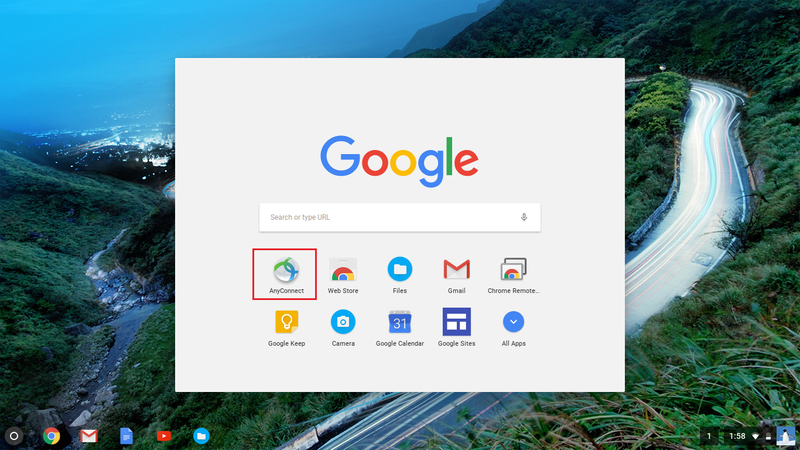 To disconnect, click on the Cisco AnyConnect VPN Client icon and select Disconnect, or open Cisco AnyConnect VPN Client and click the Disconnect button. Note: DO NOT download Cisco AnyConnect VPN from the vpn.nmsu.edu link. The VPN will not install correctly and may harm your computer. On your desktop, navigate to the Web Store. 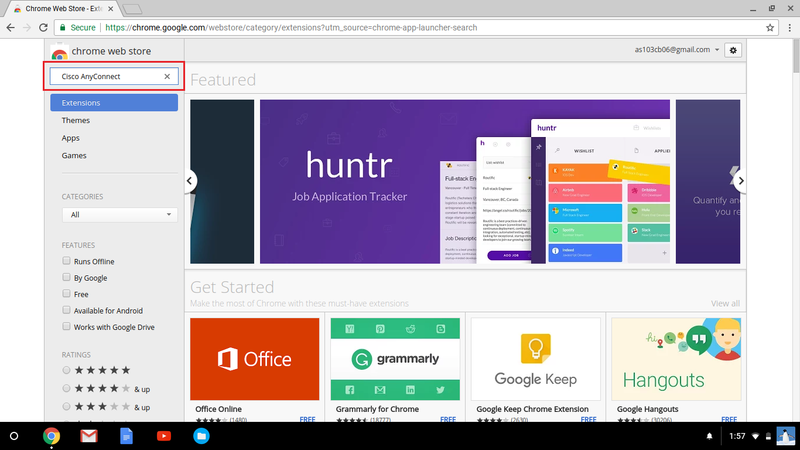 This can be done by searching in the Search bar (on the bottom left of the screen or via the magnifying glass button on the keyboard). 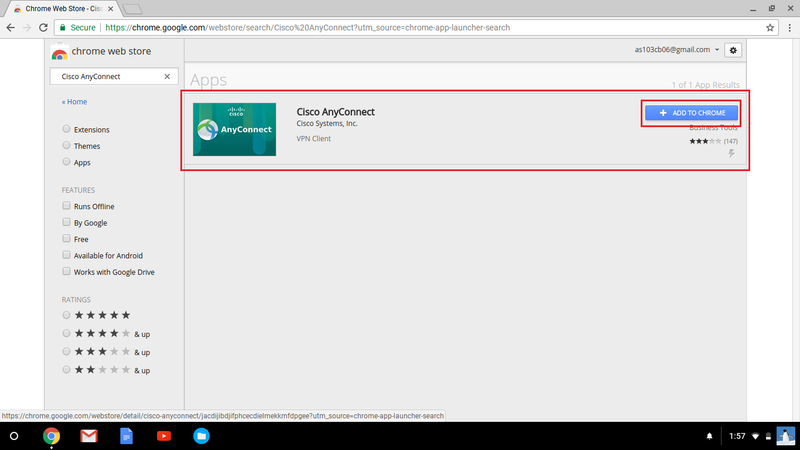 Once available, search the Chrome Web Store for "Cisco AnyConnect". 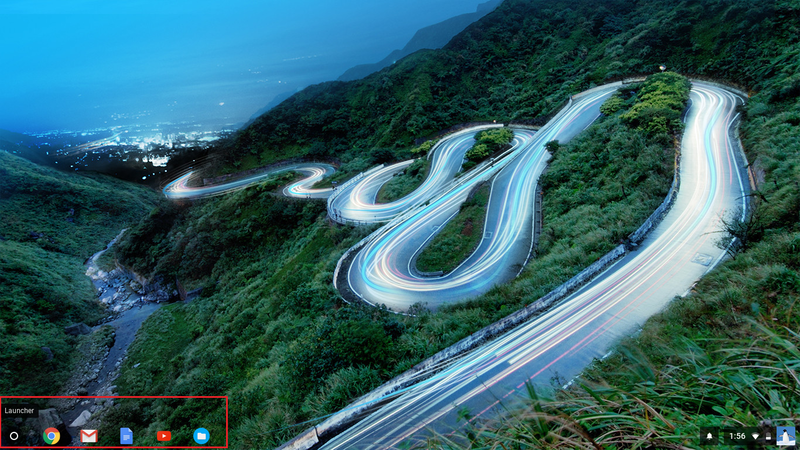 Here, select the blue "Add to Chrome" button. Once clicked, select the "Add app" option. 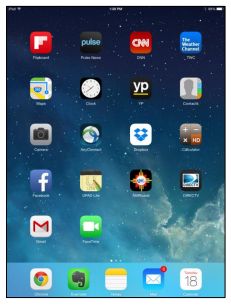 Now, the app will begin the installation process. Once completed, a "Successful Installation" notification will appear and the blue "Add to Chrome" button will change to a green "Rate it" button. 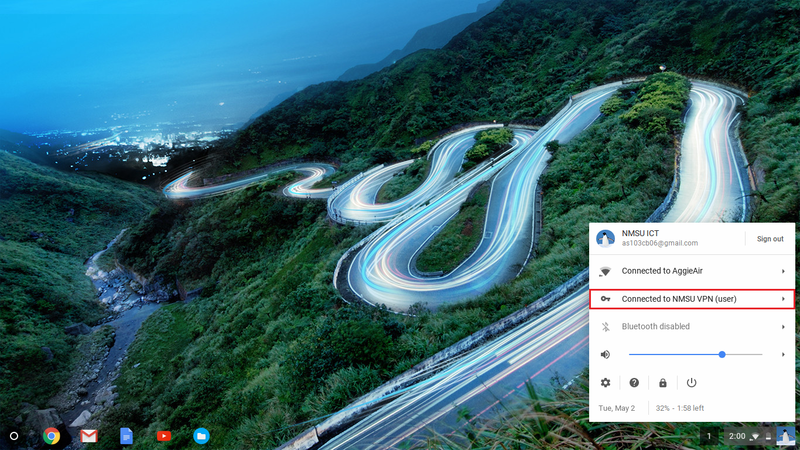 After AnyConnect has been installed, open your Search feature again and find "AnyConnect". Once found, select "Add New Connection". 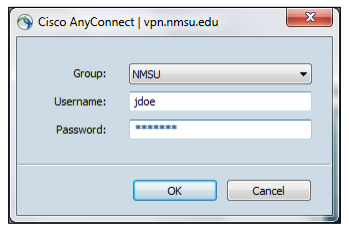 When prompted, enter "NMSU VPN" in the name box, and "vpn.nmsu.edu" in the server address box. Do not alter the certificates settings. Save these changes and close. Next, open up the Status Area in the bottom right corner and select the area where it says "VPN Disconnected". Next, select the appropriate Group for your task, and then enter your myNMSU Username and Password. When done, select Submit. To check your connection, open up the Status Area on the bottom right again, and look for "Connected to NMSU VPN (user)". When attempting to access NMSU services off-campus, such as e-mail and myNMSU Banner Self-Service features (Student and Financial Aid, Faculty, Workflow or Employee tabs), your Internet service provider may not allow you access to some of these services. In this situation, you can use install the NMSU VPN Client on your computer and use it to remotely log into the NMSU Campus Network. This allows faculty, staff, and students to access myNMSU Banner SelfService features, Canvas, and NMSU e-mail from off-campus. Before going through these steps, please verify that your Mobile device is up to date. 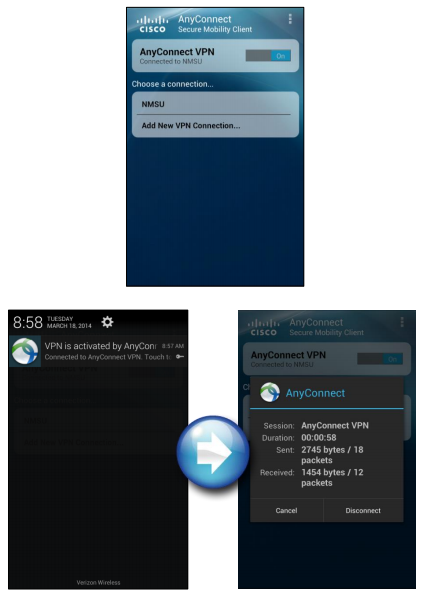 Cisco releases periodic updates to the AnyConnect App to address bugs and compatibility issues. Please make sure the AnyConnect App is kept up to date. *Note: Quality and reliability are subject to the mobile device's coverage, signal strength, provider, and the mobile device itself. 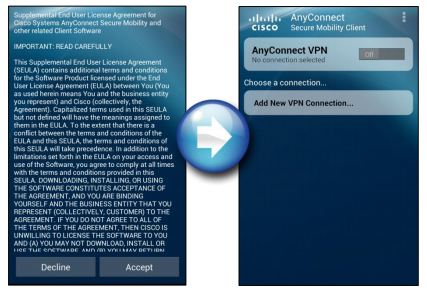 Download the Cisco AnyConnect VPN Client from the Google Play Store. 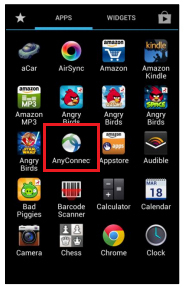 When you’ve downloaded the client, launch the AnyConnect App. Set the Description to NMSU and the Server Address to vpn.nmsu.edu. Then tap Done. Tap on the new NMSU connection you just created. 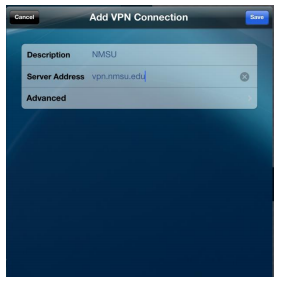 Enter your NMSU username in the Username box and your NMSU password in the Password box and tap OK.
Download the Cisco AnyConnect VPN Client from the Apple App Store. Then launch the AnyConnect App. Set Description to NMSU and Server Address to vpn.nmsu.edu. Then tap Save. Make sure your new NMSU connection is selected and swipe AnyConnect VPN from the OFF to the ON position. In the Authentication window, enter your NMSU username in the Username box and your NMSU password in the Password box and tap Connect. You are now connected as indicated by the VPN icon in the Notification Bar at the top. 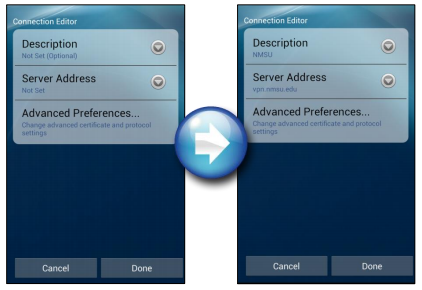 To disconnect, open the AnyConnect App again, and swipe AnyConnect VPN from ON to the OFF position.